Combine the dry rub ingredients, smooth over the ribs and marinade for3–4 hours or overnight. Preheat the oven to 180°C. Add the cider to the ribs and cook, covered, for 2½–3 hours or until the meat is tender and falling off the bone. 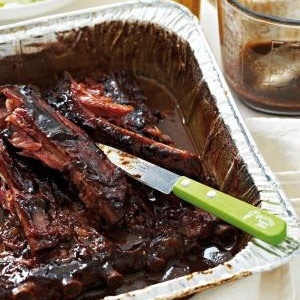 Uncover and pour over half the glaze, return to the oven for 20 minutes or until the ribs are browned. Turn over, add the rest of the glaze and cook for a further 15 minutes or until well browned.